Barbecues are an all-American phenomenon that not only brings people together, but also get them talking. There’s no better way to be a part of the conversation than by having your brand name adorned on clients’ BBQ tools and grill sets. Have a look through our sizzling hot range of promotional goodies and see what gets those creative juices flowing. At ePromos, we’ll work with you to pick and design tasteful personalized BBQ sets that recipients will be glad to use repeatedly. By imprinting your business information onto these everyday items, you’re securing an investment that’s sure to return a high profit in brand exposure and recognition. Camping and picnics will be even easier with this Mesa Portable Custom BBQ Grill Set! Simply open the supporting legs and unlatch the lid to reveal a grill grate and charcoal bin. The grill grate can be raised and lowered so recipients can grill at the perfect temperature. This promo BBQ set comes packed with everything you'll need for a day at the grill. This all-in-one custom grill set has got you covered for a successful BBQ. Twelve piece promo BBQ set makes a great gift to show your appreciation. Be ready for your next barbecue with this stainless steel 11-piece custom BBQ set. Non-woven fabric case holds this logo imprinted BBQ set that includes silicone handled spatula, basting brush and tongs handy case. Collapsible for Easy Transport! The Portable Custom Grill comes with a convenient carry bag so you can store when not in use. 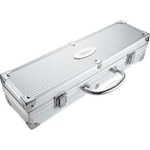 Can easily be transported to the beach, outdoor events and picnics! Three piece promotional BBQ Set makes a great appreciation gift for the grill masters in your team. The Dip-It Custom Snack Bowl is the perfect size for your fruit and vegetables or chips and dip. Ideal for promoting healthy living and portion control by providing pre-portioned servings. 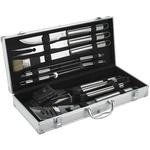 Promotional BBQ set includes wooden handle utensils packed in convenient zipper carry case. All the utensils you need to cook while camping are contained inside this camo patterned promo BBQ set. BBQ parties will never be a burden with this PolyCanvas Custom BBQ Apron with Grilling Mitt and Bottle Holder. The insulated pocket to keep drinks cold and other pockets for your grilling essentials. Made for the barbecue expert in mind. Keep your condiments neat and organized with a 4 cup custom tray with 3 imprint areas. These promotional BBQ utensils set makes the perfect gift for any master of the grill and it's already gift boxed for you. These 4.25 gallon metal custom buckets are a great way to add a touch of down home country style to your promotions! No more juggling between your food and beverage with this custom snack and wine tray. Keep your condiments neat and organized on table tops with a custom caddy imprinted with your logo. 5 quart metal custom buckets are a great way to add some down home country style to your promotions! These galvanized metal custom buckets are a great way to add some down home country style to your promotions! Grilling days have become a year-round dining event. But heading to the BBQ is especially important in the summer and warm days are always just around the corner. So, think about pool parties, picnics and lazy days at the beach. Start being creative about your summer-themed promotions. Here we’ve compiled a few of our favorite summer-time grilling products for your consideration: personalized grilling utensils, grills, grilling accessories, and other useful supplies. Finding an ePromos product that is relevant to your business and desired by your customer base is easy. In fact, with all these accessories for grilling, the hard decision will be narrowing down which item you want to promote your business. Customers and employees love receiving useful items, and every time they head to the grill these gifts will give your brand exposure in a positive light. Look at our portable grills and grill and cooler combinations for an executive gift. For more affordable barbecue gifting, our personalized grill set includes all the essentials: spatulas, tongs, basters, forks, hot mitts and grill cleaners. Our deluxe sets include meat thermometers, skewers, corn holders and carving knives. These kits are brought together in some great containers and you get to choose the holder that matching your type of branding: wooden chests, sturdy metal cases, chef’s aprons, lightweight aluminum boxes, camouflage canvas bags, strong fabric carrying cases and a variety of coolers. And remember, the more useful and desirable the item is, the longer it will stay in the hands of your potential customer. Promote your picnic, beer festival, wine tasting, summer soiree, BBQ testing, musical concerts or tailgating party with promotional products from ePromos. In addition, you can send the right message to your employees by sending them personalized grilling tools for the cabin at the lake or their backyard patio, reminding them to create a life balance of work and play. Or, if you’re the point person planning a company picnic or outdoor event and the one tasked with finding promotional gift ideas such as an engraved barbecue set, we are here to help you. For your next grill-inspired promotion, shop the biggest collection of custom barbecue and grilling promotional products at ePromos. Give us a call or you can also place your affordable order right here on our secure website.